They’re running a bit behind tonight. 7:30 and cars are still rolling around the track. Track officials just brought out the tilling machine to work on the middle to bottom groove of the track. Jonathan Davenport set quick in group A.
Billy Moyer Jr set quick time in group B. He was fastest overall. Qualifying concludes just after 8:30. Jonathan Davenport and Hudson O’Neal set row 1 in the first heat race of the night. Green flag, several games are being played on the start, perhaps in directly. Two failed start attempts. Green, Hudson O’Neal gets the jump. He leads into turn 1. Davenport makes up all the lost ground. They run even off turn 2. Davenport runs the bottom in turn 3. They fight for space all the way through 3-4. Door to door rubbing for the lead. Davenport has it off turn 2. Lap 8, Sheppard is coming for the lead. The run nose to tail coming to the checkered. Josh Richards and Devin Moran trail the pace truck to start heat race number two. Green, Richards drives it hard to the bottom in turn 1. He jacks it sideways and slides in behind Moran off turn 2. The slider wasn’t going to work, though he thought about it. Lap 2, Richards is on the bumper of Moran into turn 3. Again, he drives it deep on the bottom. He’s clear. 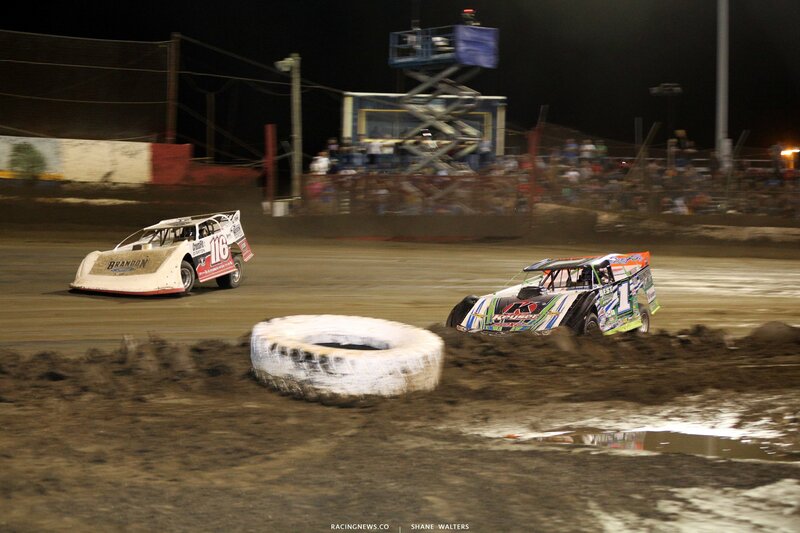 Richards drives away to win by more than a straight-away in heat race number two. Tyler Erb and Earl Pearson Jr lead them to the green in heat race number three. Green, they see-saw at the line. Yellow, false start. Trouble! Coleby Frye got into the back of Tyler Erb as they slowed down the back for the yellow. Minor damage to both. Green, Pearson is gone. He hit the cushion in turn 1 and never looked back. Pearson wins heat 3 by more than a straight-away. Billy Moyer Jr and Dennis Erb Jr set the front row for heat four. Green, Overton is all over the bumpers of the front row into turn 1. Moyer leads. Dennis Erb, Overton and Owens run 3 wide through turns 1-2. Erb wins the race for 2nd into turn 3. 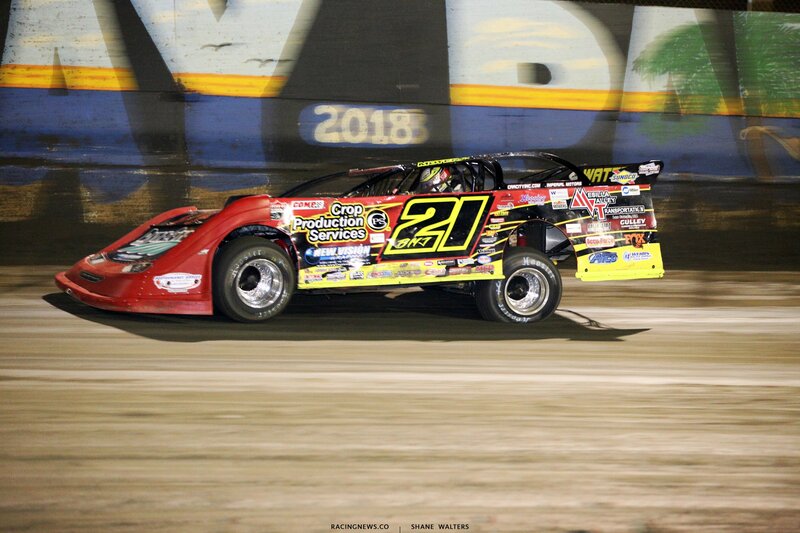 Billy Moyer Jr drives away to win heat race number four. 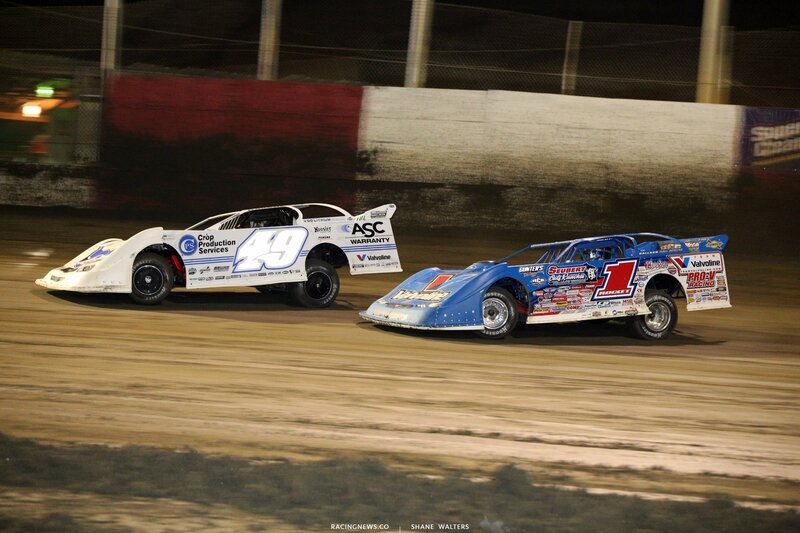 Bobby Pierce and Gregg Satterlee pace the field to the start. Green, Junghans is around in turn 2, complete restart. Green, Pierce drives it deep into turn 1. He’s nearly clear of Satterlee. Pierce thinks about sliding up to the cushion. Satterlee is there. They run door to door off turn 4. Satterlee takes the lead. Lap 7, the caution is out. I didn’t see it but I did see Chase Junghans and Ryan King run into each other under yellow. This one looked very intentional. It looked like Junghans was on the giving end, he pulls to the pits. Green, Satterlee leads. Pierce is struggling to get going. His car jumps sideways and they roll by. Pierce has lost 3 positions before turn 1. Satterlee wins heat race number five. 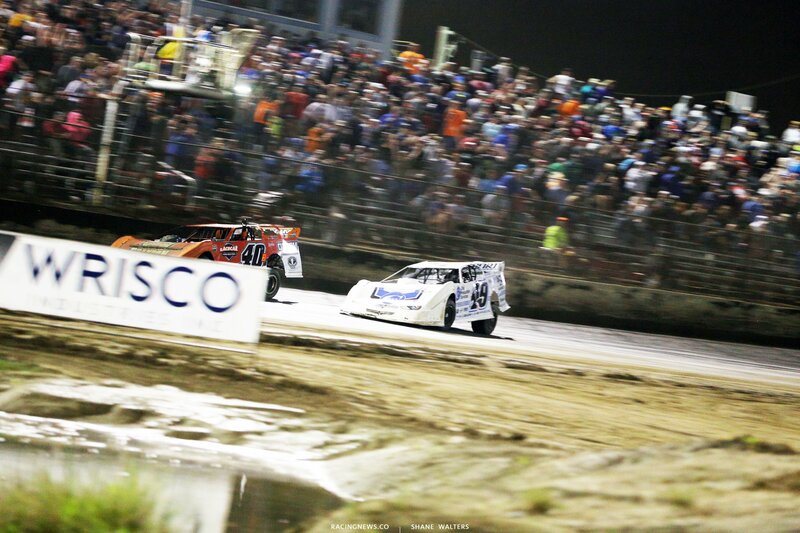 Scott Bloomquist and Freddie Carpenter lead them to the start of the final hear race of the night. Green, Bloomquist leads into turn 1. He has no pressure from behind. Lap 7, the caution is out. Craig Wolford has spun into turn 1. 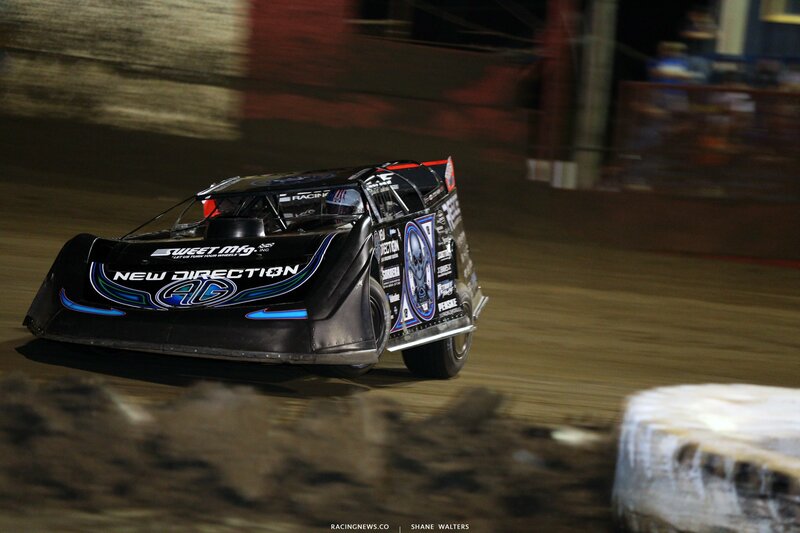 Green, Bloomquist picks up where he left off. Bloomquist wins the sixth and final heat race of the night. McCreadie, Briggs and Pierce take provisional starting spots in tonights main event. 60 laps around East Bay Raceway Park is next. 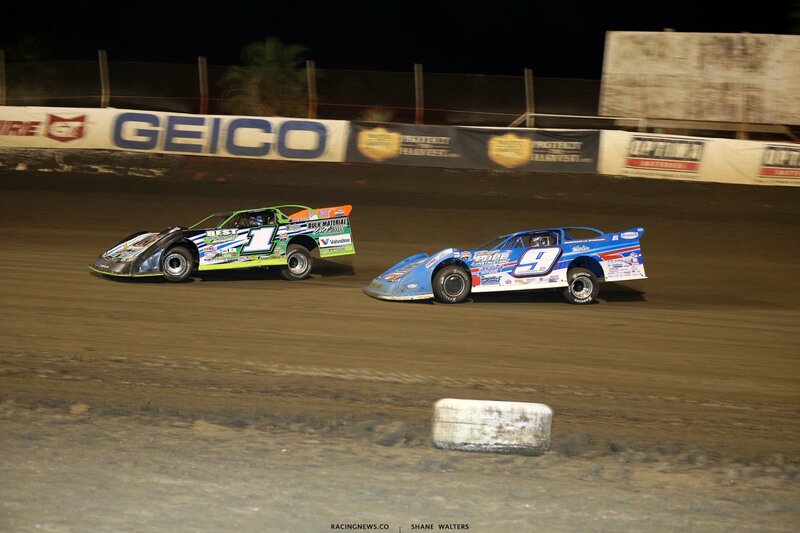 Jonathan Davenport and Billy Moyer Jr will lead the field to the green flag. Green, they’re even into turn 1. Davenport cuts it to the bottom. Hard on the gas, he leads off turn 2. Moyer comes under fire from Richards. He holds him off. Green, Davenport hits a jump in turn 1. He still leads but Moyer Jr is there. Moyer looks low in turn 1. They run even through the corner. Even into turn 3. Moyer completes the pass on the bottom back in turn 1. Davenport hits the jump again. 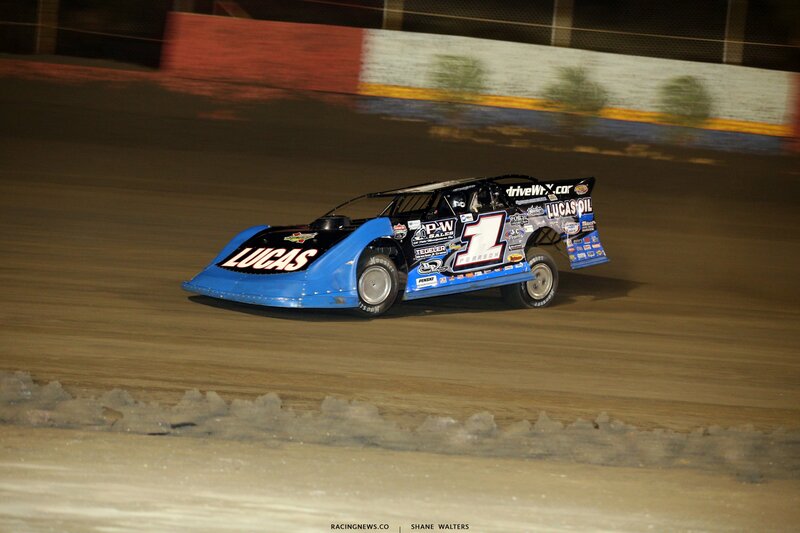 Bloomquist is already on the gas, Bloomquist to 2nd. He’s running down Moyer. 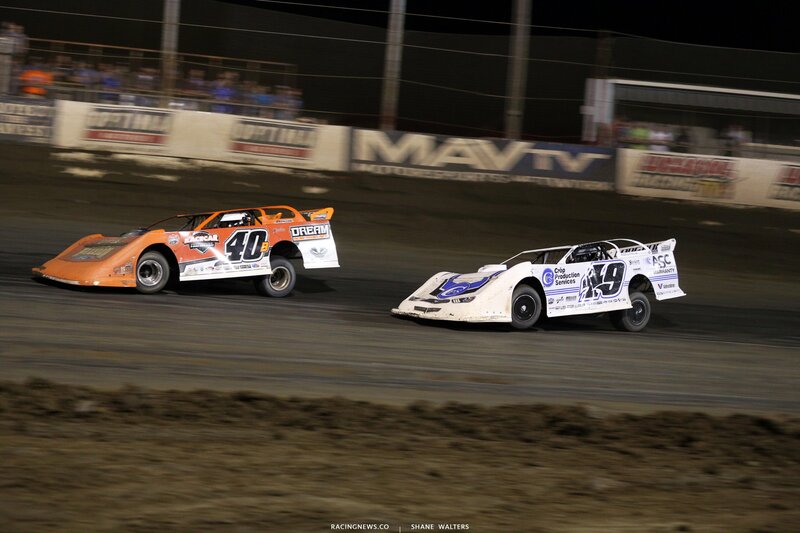 New leader, Bloomquist to the top spot. Lap 22, Sheppard is up to 4th. He started in 8th. 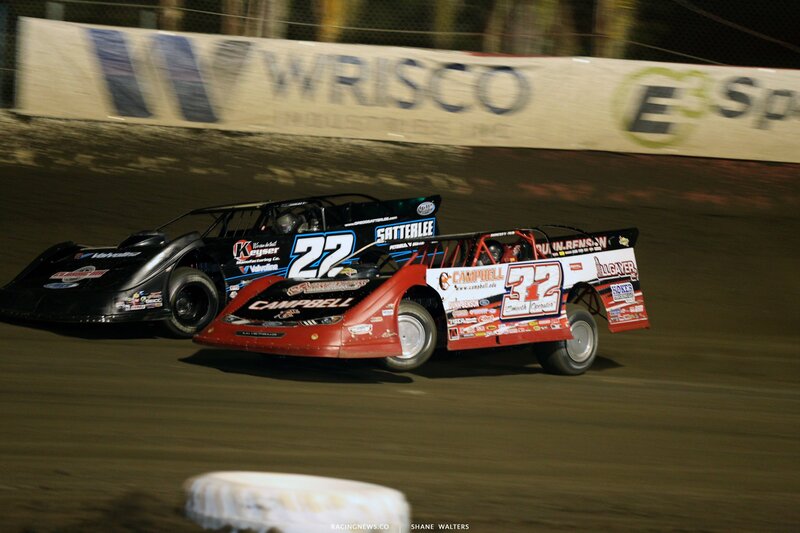 Bloomquist and Richards moves high to work around lapped traffic. Lap 25, Richards looks low on Bloomquist for the lead. Lap traffic is just ahead. 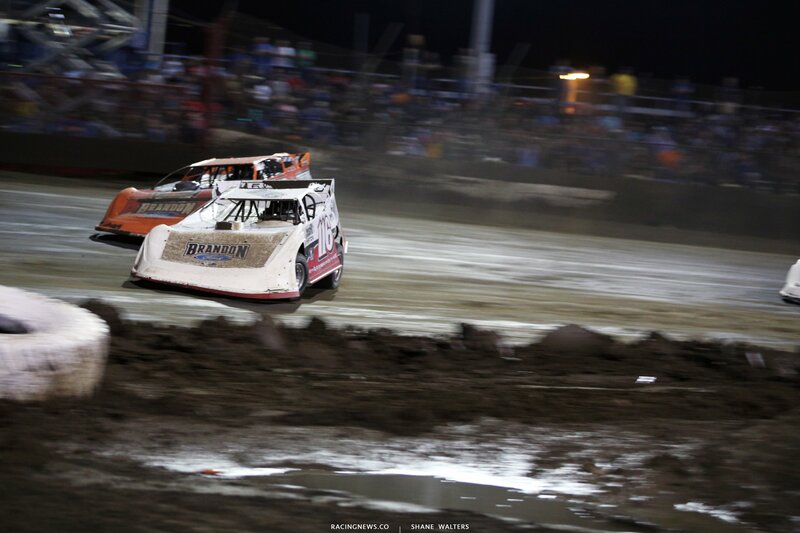 Richards slides Bloomquist then jumps to the cushion to continue working on the lapped cars. Lap 28, slow car in turn 3. The caution is out. Green, caution. McCreadie heads for the pits. Green, caution. Pierce and Don O’Neal head to the pits. Pierce has a flat. Pierce didn’t make it back out. Yes he did! Last second arrival. Green, Richards has open up a 5 car length lead. Trouble! Billy Moyer Jr has hit the inside berm in turn 1. He car loops backwards on a dime. He drives it up the banking in front of traffic and keeps going. No caution, he only lost a handful of positions. That was something! Caution is out. Moyer Jr hits the pit lane, he’s back out. 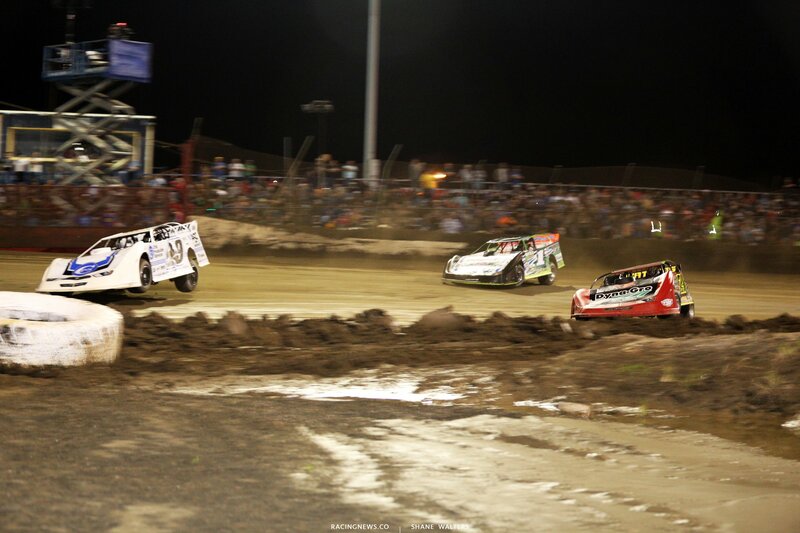 Green, Sheppard and Bloomquist race for 2nd in turn 1. Sheppard hits the cushion and takes the position off turn 2. Trouble in turn 3. McCreadie is in the wall. He climbs out to check the car. They attach is to the hook. Lap 35, green flag, Sheppard slips and Bloomquist is back to 2nd. Richards still leads. They’re 3-4 wide and banging fenders for 5th on back. Lap 40, we’re green but Billy Moyer Jr has his hand out the window pointing at the pits. The caution is out for Don O’Neal, he’s off on the hook. Green, Overton is flying. 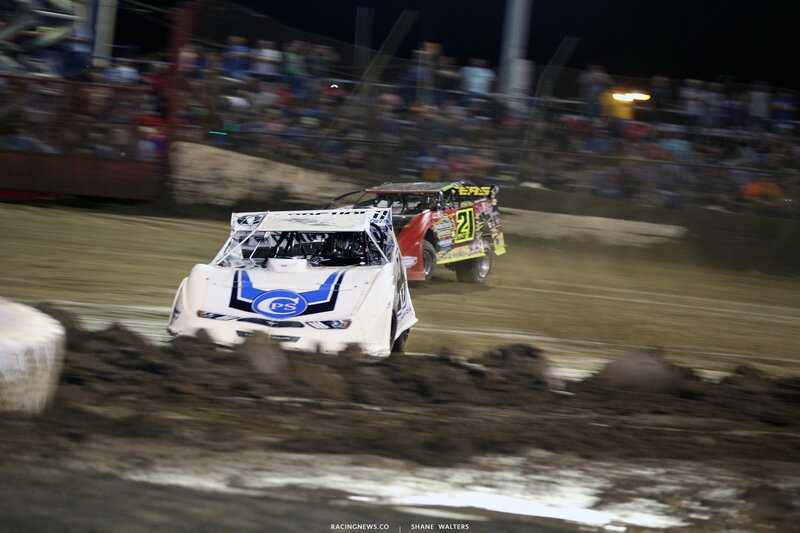 From the outside of row two he beats Bloomquist to the bottom in turn 1. Overton selects the middle if the track in turn 3. He’s back on the gas 10 feet sooner than Richards. Overton has a run off the corner. On the outside, Overton takes the lead in turn 1. Lap 42, the caution is out for Ryan King. 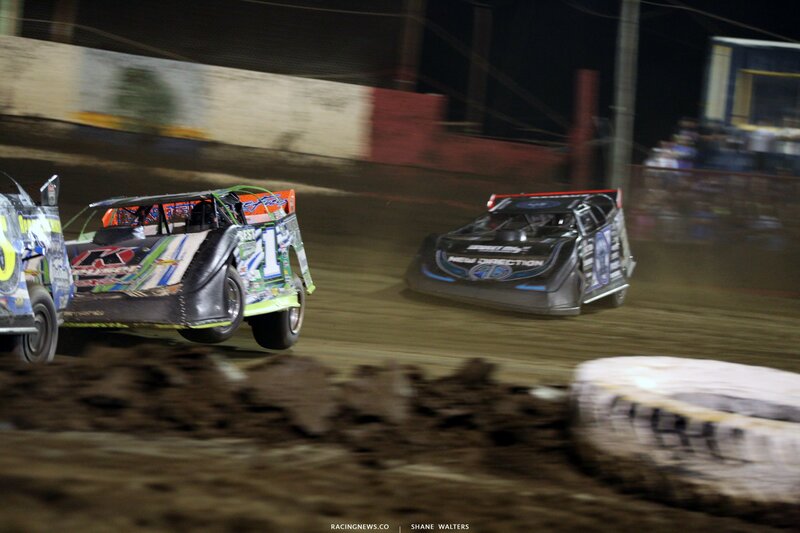 Green, someone put the bumper to Bloomquist in turn 1. He’s struggling to regain momentum. They’re 4 wide as he collects his car. Bloomquist has fallen to 8th. Overton leads by a full straight away. Bronson has climbed from 10th to 2nd. Lap 53, caution for Owens. He shredded a left rear tire on the restart. Green, Overton spins his tires on the launch. Kyle Bronson pulls even with him at the flagstand and the crowd stands to cheer. Bronson looks to the outside in turn 1. Overton slides up the banking to take the line away. Bronson runs the middle in turns 3-4. He has a fender on him at the exit. Overton spins his tires down the front straight. Bronson takes the lead and is clear by 3 by the time the get to turn 1. Davenport to 2nd. Lap 57, trouble in turn 3. Moyer Jr, Hudson O’Neal and Owens are tangled. The caution is out. Green, Bronson leads. Davenport is closing inch by inch. The both run the middle. White flag, Davenport diamonds the corner in turn 3. He’s got a run on the inside off turn 4. At the line, Davenport wins by 3/4 of a car length. 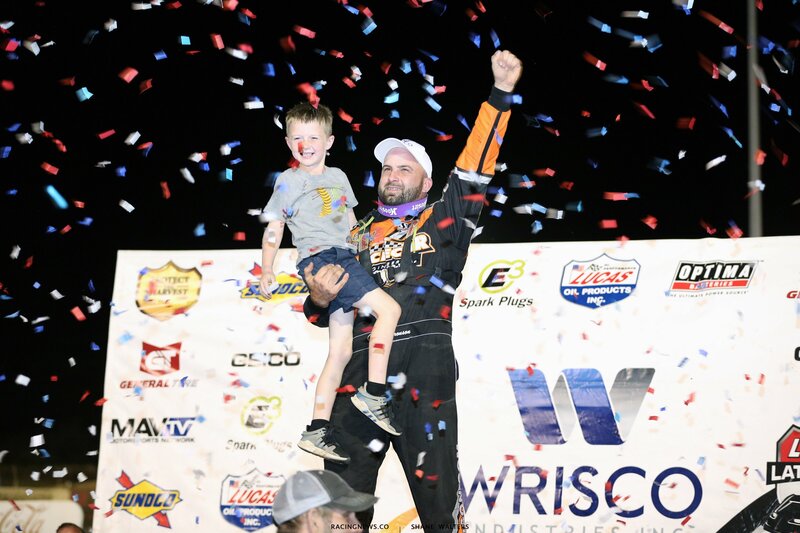 The hometown guy wins at East Bay Raceway Park! Tomorrow, the tour heads to Ocala, FL. The Lucas Oil Late Model Dirt Series will unload at Bubba Raceway Park.